Town officials have been notified by the state Department of Transportation that an inspection several weeks ago revealed structural deficiencies in both the substructure and ornamental truss structure of the William F. Cribari Bridge. Repairs begin on July 30. The tentative schedule calls for 6 weeks of work — weather permitting. The contractor will work between 8 p.m. and 5 a.m., Mondays through Fridays. The bridge and sidewalk will be closed to vehicular and pedestrian traffic. Marine traffic requiring bridge openings may be limited during work periods. ConnDOT will continue to focus on the longer term future of the Cribari Bridge. As previously announced, their Project Advisory Committee meets tonight (Wednesday, July 18, 6:30 p.m., Town Hall auditorium). This entry was posted in Organizations, Saugatuck, Transportation and tagged Connecticut Department of Transportation, William F. Cribari Bridge. Bookmark the permalink. Will the bridge be drivable during the day? The press release did not say otherwise. This comes as no surprise. However historic the bridge may be, it is a beaten up, rusting structure and an eyesore in a part of town undergoing a renaissance. Other than to carry on the memory of William Cribari, I’m not sure why people are fighting so hard to save this bridge in its current form. It’s not all that pleasing to the eye. A new bridge carrying the same dimensions (in order to stay within the character of the neighborhood and to prevent an increase in traffic) and architectural characteristics should be built to replace this aging structure. I’m inclined to agree. Driving on it kinda scares me too. And being stopped on it just for the light makes me think of a disaster waiting to happen, sorry! I didn’t realize there was such a thing as a bridge tender for that particular bridge! What year are we talking here, and and what was your great-grandfather’s name? Historic District Commission has the dates, but I can tell you that two houses on Imperial Ave were bridgekeepers’ houses at various times. What do you know, literally moments before the strange bridge meeting that DOT has set up, this comes out. I’m sure it’s just a coincidence that the ornamental trusses (damaged by state plow drivers a decade ago) suddenly are an emergency – today. Comical if not sad. Some people get in the way of progress, the same get in the way of improving our town and building a river commerce opportunity, and now the very thing they are protecting, turns out to be dangerous. And now the Bridge will be forced into limited use until repaired. It does raise the question as to how dangerous is this bridge? Bart, I’m not sure if you know this and I’m not trying to be dismissive of your thoughts (I think your comments on Hartford are dead on exactly 100% of the time) but the bridge in question was in place during the high point of Westport’s manufacturing and shipping era. It’s really quite interesting to read about the kind of stuff that was being made right here along the Saugatuck River. Morley. I understand the bridge was built many years ago. I understand that manufacturing was here many many years ago. Time has elapsed and Westport has progressed. The bridge has past its useful life. It really has. Let’s embrace change, let’s insure we maintain the look and feel in a Saugatuck, let’s make sure something new is useful for cars and bikes and not trucks and also safe. It’s not our bridge – but you saw the plan by the owner, right? The proposed span (before the money for it was broomed) was tall enough to allow 18 wheelers and cost twice the repair option. Morley, if I remember the images correctly, it also looked like several buildings/residences might need to be claimed to allow for the temporary bridge structure next to the Cribari bridge, also. Morley and Elizabeth, Please stop with the misinformation, the temp bridge would be in the same spot as in 1991 when they replaced the entire bridge and foundation supports but left the truss to simulate the old look. This would mean the sidewalk and a small part of the mansion parking lot will be borrowed and then returned upon completion, no eminent domain, no eastern property claimed period. The cost over the 75 year life expectancy with either restoration or replacement is identical, only difference is replacement would mean no “mid life crisis ” repairs like the last one when sandy flooded every electrical component . That took 5m and a ton of traffic because of needed closings . This would still be vulnerable to flooding if a restoration not a replacement is to be done. Its in the Conndot plan online look it up. Morley tried to puff more mis-info at the pac meeting and they asked him to sit down and hand the mic over to someone who wants to be part of the solution and not just an obstructionist. They will listen to our truck traffic concerns and try to mitigate but if all the focus is to obstruct they will simple do what they want with the bridge they own … this is getting old and dangerously slowing down the process and putting peoples lives at risk. This next group of closings is on you … they are welding plates and cross bracing to the non essential old truss system so it doesn’t fall over including a quick fix of the rotten underwater supports so it doesn’t fail and all traffic is prohibited . Imaging 6 months of no bridge access till a temp bridge is installed. While I have your attention, the Saga R.R .bridge and several other projects north of the bridge street bridge have begun and are starting next week that need barge and crane support . I have the only yard with a crane that can be accessed by the barge on the River which means the bridge will swing often, I just hope it doesn’t fail like the other day and and can no longer be used , not just for a few hours but indefinitely. We all love the look of the bridge, we can still have that just look at the conn-dot web site. We all love the River, We can help it . We all don’t want traffic especially trucks . Lets figure it out. Morley-not to ruin your day-but the latest figures out of Hartford (OFA report) is the state will run a $11 BILLION deficit during the next 4 years of a new governor. CRAZY. Where will the money come from. I believe we talked about a coffee one day. I’ll buy. Yikes. Happy to talk with you over coffee. Maybe we need something stronger. Stronger-yes. We are facing what I would consider the most difficult time in CT’s history. I will send some dates. Bourbon one ice cube is good for me. Bart, although usually on your thinking we agree we seriously disagree here as I lived on Bridge St for 12 years I get the territory. First, the state clearly wants a bypass road for I-95, as Westport is a choke point for traffic and any accident, maintenance or hiccup of any kind backs traffic up for miles. Greens Farms Rd / Bridge St / Saugatuck proper is not conducive to bypass for trucks and commercial vehicles due to the bridge and the 90 degree turns to riverside ave The current situation is bad at such times but add the truck bypass and you effect many neighbors along that route and will increase commercial traffic. Remember when the tolls were before exit 17, get ready for electronic tolls and trucks avoiding them. Second, the plan to replace involves not only the height limiting bridge but also taking land on either side of bridge st to Imperial , most likely through emanate domain, as well as a rotary at the riverside ave side to allow larger vehicles which a land take would be needed. I for one am not a fan of government taking property. And lastly, this is a historic area no doubt that would be compromised and with the various issues around town where preservation is being championed by many different groups for different reasons this is a beachhead issue. Clearly my biggest concern is the loss of the historic, quaint, traffic limiting, bridge with an expanded 4 lane pass through. Think its bad now it can be much worse. Good points Chip. Thank you for your insight. Is there a way to develop our river? Lest i change the topic of the debate – but what can we do about the closure starting at 8pm? This feels like it will unfairly penalize commuters trying to come home to see their families. This will be beyond a major inconvenience for our neighborhood (we live on Imperial) and those of us who still consider 8pm part of a rush hour commute. With two small children, it’s hard enough for us to race home from the train station to see them let alone now having to figure out where and if the shuttle will drop off close by and adding significant time to our return. Can’t this work start later – like 10?! Who can i bring this to? I watched the last meetings to replace the bridge with a new structure on line. I saw the proposed pictures. I don’t remember the exact language but the idea was to try and convince residents that the new bridge would maintain the visible character of the old and also blend in well with the neighborhood. That was an attempt to fool everyone. The proposed “new bridge”would allow heavy traffic and large trucks to cross. It would scar the shore line and be a nightmare to the whole area. If I remember correctly, at the time the ornamental Trusses were an issue then. It turned out all that was damage caused by snow plows and not detrimental to the safety of the bridge. This needs to be thought through very carefully. A new bridge just might cause more problems than it solves. Be careful what you wish for. Im a history buff, but as I read these comments, the stark reality of safety looms large. IMO, there is no question that the bridge MUST be replaced, not repaired. The new bridge should be in keeping with the surrounding ambience, be a simple structure built to last. Absolutely no large trucks on this new bridge. With the bridge closing down at night, is the only detour to drive down Riverside to the Post Road? Eleanor, you may be interested to know that, after persistent questioning by a resident tonight at a public hearing regarding the bridge, the DOT admitted that it could NOT “legislatively” build a bridge which did not accept “all legal loads”. And you know what that means: 18 wheelers. Who will guarantee absolute safety during repair or reconstruction? 8pm is too early. they should make it 10 pm to 6am like most major construction. would be great to see details on what exactly is being done, at what cost, and why. Many thoughtful and stimulating comments here today about this bridge and the situation at large. Decisions made will affect traffic through this very (already) excessively congested corridor for many years to come. – sea level rise at extremely faster levels than we’ve been led to believe are occurring (unless one seeks out the less than readily available scientific data). – more occurrences of unpredictable and unprecedented weather events, including swelling of and flooding from inland river-ways. While I realize there is still a “debate” occurring about the urgency of such outcomes among many, it seems to me that this should be the foremost thing to be addressed, with regards to our infrastructure choices/decisions. Historical preservation is so important (I’ve had memories associated with the Cribari bridge since the 1970’s), but we also should look much farther down the road regarding longevity/sustainability of our infrastructure. I don’t have answers … just suggesting a way of thinking about this, in a way that reflects our larger global climate crisis, and how to adapt. (Note: I am wholly and fully in support of the fact that this bridge should, in no way, be able to accomdate any trucking or excessive I-95 traffic of any kind … that would contribute to the nightmare of infrastructure-planning-gone-bad. I am no expert on the matter, and have no political affiliations to persuade me. Just my thoughts here). Ugh … noticed a typo in the midst. At the preliminary PAC a few others and I tried to get specific information about the noise, equipment, and light levels during the repair work starting this week. I also tried to get assurances that residents near the bridge would be shield as much as possible. ConnDOT officials promised to provide information about these matters. How and when they do this will be the first measure of what we face with regard to the bridge. Reiterating what others have said: ConnDOT clearly stated tonight that a new bridge means tractor trailers. Have any of you realized that during the several hours of morning and evening rush hour the police, fire, and EMS can not use this bridge? Because it is so small, they can not pass vehicles when it is backed up, which seems like all day. That can add some serious response time to any calls by adding several miles. People seem to be afraid of tractor trailers using a new bridge as an alternate route if 95 is backed up. When 95 is backed up trucks routinely get off exit 17. But instead of driving 1-2 miles to exit 18 down greens farms you’d prefer them to drive down Saugatuck Ave/Riverside ave to the horrible Route 1/33 intersection, down the center of town and onto the Connecfor. Being a town with 95 running through it you’re always going to get overflow traffic, a new bridge that can accommodate them seems like the lesser of two evils. As a relative newcomer to town the Cribari bridge debate has puzzled me. To me it is obvious that the bridge has exceeded it’s useful life and needs to be replaced. I also understand the logic behind the “all legal loads” law if the state is to spend money on infrastructure. Most of the local objection seems to be based on idea that if the bridge can handle a tractor trailer then truckers will start using it regularly. I just don’t see this happening unless they have to make a local stop. What am I missing? Would agree that 8PM is too early to shut the bridge down each night. May sound reasonable on paper to an administrator. In practice this needlessly impacts those who drive/park @ the train station & those who utilize the last commuter shuttles of the day. Many Westporters take a 6:49PM express [or later]train out of GC. Families are out at the Sweet Shop; outdoor diners at the Whelk and Burger Lobster. 8 pm is prime outdoor summer family time in a very popular small area. Likely problematic for businesses, families and local residents in addition to commuters. I guess News12 had the same thought – just saw them interviewing some of the local retailers about it. I’m getting concerned about all this bridge talk. I’ll put up 25 million of my own money to either build a new bridge, or initiate the fix on this one! ok, “we” accept – the latter offer. I’ll have papers for you to sign in the morning, and we thank you for your generous support. cha-ching! Sharon, This is getting better every day! Morley Boyd knows the facts and the nuances. 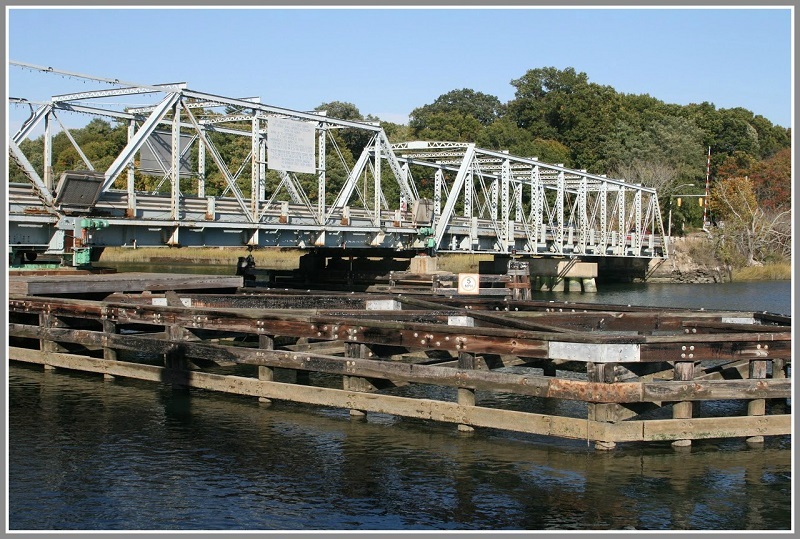 Yes, Morley has long worked hard to preserve important aspects of Westport’s wonderful history and his thinking on the Cribari Bridge is another example of his commitment to preservation. However, for all those who seek answers to important factual questions, including most importantly the size and impacts of the bridge that the CT DOT is likely to want, Morley will provide answers that should be used by all. I want to preserve the Cribari Bridge and expect that any significant changes to the Bridge that the CT DOT may promote will be harmful to traffic, noise, pollution and the quality of life of that important area of our fine Town. The recent Town Saugatuck TOD Study strongly supports the preservation of the Cribari Bridge. The analysis in that Report as to the Cribari Bridge is sound. Thank you for your kind words, Don. Last night’s hearing on the bridge only confirmed what many regular 06880 readers have long known: Any replacement span will be designed by DOT to allow 18 wheelers. Period. No exceptions. Awful. Hopefully it can be blocked. Morley-thanks for all your work. I want to say – just once more – that the bridge is not the key to controlling traffic in Saugatuck; the better approach is to persuade the state to prohibit truck traffic on that stretch of Rte. 136 which uses the bridge, as Darien has done successfully with Rte. 136 between MLK Blvd. and I-95 interchange 11. Now, while we have the state’s attention focused on Westport, is the time to begin that effort to pave the way, (no pun intended), for a new, functional, attractive and architecturally significant span. To save the existing bridge simply to limit truck traffic makes just about as much sense as addressing speeding by insisting that we keep all of our roads in a permanent state of disrepair. There are many things in Westport that deserve to be preserved, but the Cribari Bridge is not one of them. Have you started the petition to have trucks banned from Greens Farms Road, South Compo, and Bridge Street? If so, I’ll sign. If not, why? Werner you don’t need a petition , just sit at the table with the d.o.t and work it out, Im told Westport PD is in support. The statute to ban through trucks only considers road geometry. Go sit outside at Rowayton market and count the tractor trailers during rush hour or with a 95N jam. im currently working on a home site a few lots north and have worked thru out Darien since the truck ban… no tractor trailers get off exit 12…. at all.. none.. and that exit is a easy right turn and simple drive into town unlike the winding saugatuck area. conndot would give us the ban if we sit down and bargain not just obstruct. I hope you and others come onboard for the ban no matter what is decided. And good luck with a local Truck Prohibition by Weight Class Ordinance for Greens Farms Road. That’s a de facto Thru Truck Ban on what will be a legitimate truck route once the larger Saugatuck bridge is in place – and it will thusly get thrown out. DOT has already stated for the record that it’s “not in the business of restricting traffic”. It said it again this week. I believed them the first time. While I completely agree the conndot is in the moving traffic business they also are in the deal with community business. The Rt136 section in rowayton is an exception to that statue, Darien and rowayton got it passed and enforce it with great success, why can’t we? unless its the truss system thats really the motivation and thats about ready to cause a major mess to the point that most will not support it much longer. Im told westport PD is looking into this ban on rt136 and town owned sections. would you be interested in putting your focus on that seeing as the dot is clearly moving forward with our without local support? I like the truck ban we have right now. That “truck ban” from what I saw at the pac meeting is coming down with or without our consent, they will go for the “broomed” funding and get it as well. I strongly recommend a change of direction to focus on this ban on 136 and town roads to prevent the over flow. its possible. I would encourage you to read the statute when you can. By installing a wider bridge you’d actually taking away the one real thing that the law recognizes as a legitimate reason to consider such a ban: narrow geometry. ok how did the truck ban on rt136 in rowayton /darien get it passed? I encourage you and Larry to do that. There are alternate truck routes there, that’s why. The statute talks about this. I know it seems like it should be a cinch but it’s not. The cruel irony is that if you replace this span with a wider one, you actually make it harder to argue for the thru truck ban because you’ve improved the road geometry greatly – and don’t forget all the intersections south of the bridge all the way to I95 will have to be blown up and enlarged as part of the bigger span project. I am curious … why would a newly constructed bridge necessarily be designed as a “wider span” in the first place? And, why is it so difficult to conceive of the idea that a smart, newly designed bridge, couldn’t still be built on a small scale, to match the current blueprint, but also be mindfully constructed for the turbulent nature of climate “change”, in terms of sea level rising and extreme flooding conditions? I feel like no one is addressing these ideas upfront. Infrastructure “improvement” in the United States is lagging far far behind many other countries. Am I alone here? What am I missing? Your questions are good ones. Just know that DOT only builds to one standard. And that is a bridge that is wide enough and tall enough to accept “all legal loads” . This explains why so many in the community, regardless of how they feel about the bridge from a cultural or historic standpoint, have worked out that if we give up the existing span we give a whole lot more. But for that little bridge with its retro Christmas lights, Saugatuck would be a very different place. And by different, imagine a fire hose in your living room. Sometimes in life the best thing and the right thing is to dance with the girl you brought. This week’s awful yet revealing meeting with our friends from DOT sure made that choice seem easy. Sharon has a great perspective, we need to find a smart plan. Conndot will widen and meet the heights minimums in either a restoration or replacement. They are not going away. The old bridge is in deplorable condition and will fail. as it did the other day. They stated they won’t spend the funds needed to get it safe and not meet the minimums. Look around, Saugatuck is already a very different place and its continuing to change some good ,some not . but the only constant is that very thing ….Change. The alternate truck route you speak of is rt 1…. Just like here . I do believe this is a possible answer to our truck traffic concerns. as a commercial truck driver myself I can tell you Its much easier to get off in darien head thru rowayton then it is to get off 17 and attempt to navigate the roads in town . With the pressure you can so easily apply id think this would be a plan you present to conndot as a concession . As for the many intersection expansions ,I didn’t hear that from them at the meetings other then addressing the riverside/ bridge street turn on to the bridge. this is needed no matter what is done.